In 2019 Learning Links International is planning to be working with the Ministry of Education in Jamaica and schools in the UK, to develop a new way of linking schools, as the British Council has cut support for schools in Jamaica, other Caribbean and South American countries. Successful links between Birmingham Special Schools and Special Schools across Jamaica were working well, with support from the Special Education Team in Jamaica, but this is one of the casualties of the withdrawal of British Council support. However other school links have continued and managed to fund links. In particular the link created with support from Learning Links International of Macintosh Memorial Primary School in Mandeville and St Thomas Aacademy in Birningham is still thriving and benefits all the children and staff involved. We will be learning from the success of this project as we explore future ways of linking. 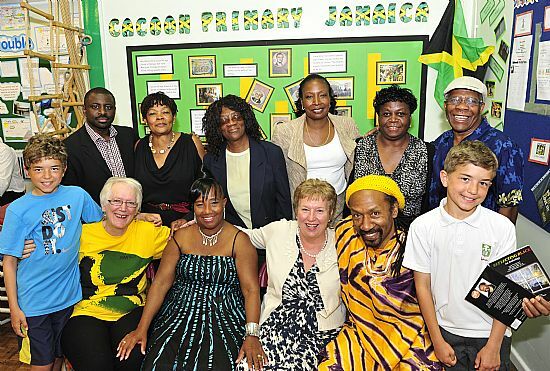 We will be work with the Community Relations Officers in each of the 6 Education Regions in Jamaica and in the UK we are starting activites to link schools in Wales with schools in Jamaica. We can offer UK schools a range of options to link with a school in Jamaica or one of the other Caribbean islands. Find out all about how your children can benefit from this great curriculum opportunity. With well over 10 years experience of developing and managing various educational links between Jamaica and UK, we are now rethinking ways to develop and promote a new range of linking opportunities between UK and Jamaican schools. In the past the LLI Unites team have supported more that 50 very successful teacher exchange visits, but until funding becomes available again, we will continue to use technology and creativity for linking, continuing to work closely with the Jamaican Ministry of Education. We will provide a range of options for Jamaican and UK schools and work with you to customise a package that will meet your curriculum and professional development needs, as well as meeting the wishes and aspirations of your partner school in Jamaica or UK. Check out www.wideninghorizons.co.uk for the background to current developments. Widening Horizons is managed by Learning Links International CIC - a Social Enterprise based in Wales.